"It's always sunny in Philadelphia" is one of the funniest comedies created by non premium cable TV channel (FX) in recent years. The project was created by Rob McElhenney, Charlie Day and Glenn Howerton. In addition, the pilot was shot with $200 digital camera and offered to the cable networks . FX picked up the sitcom and gave $400,000 to the creators for the first season. 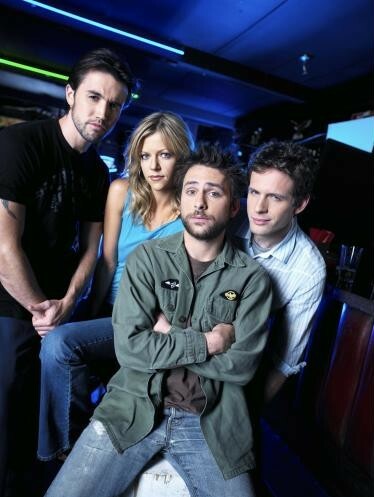 McElhenney, Day and Glenn shot seven episodes for the first season with the first one airing on 8/4/2007. From word to mouth publicity, the show got enough ratings for a second season. Probably trying to make the show more popular, FOX will release the DVD a week and half before the season 3 premieres September 13. It makes more sense to start the third season in the fall than in the middle of the summer like they did with season one and two. "It's always sunny in Philadelphia" is about Mac (Rob McElhenney), Charlie (Charlie Day) and Dennis (Glenn Howerton) best friends since high school, that decided to get a bar in order to get chicks and free alcohol. Together they own "Paddy's Irish Pub" in Philadelphia. Dennis calls on his sister Dee (Kaitlin Olsen) to be the bartender. These selfish and loser friends tackle the most serious and controversial topics racism, abortion, underage drinking, molestation, cancer and death, of course they will try the get the most out of each situation for their personal interest (girls, alcohol and keep the bar running). Sometimes these 20 something friends will try to scam one another creating a funny, "intelligent" and outrageous comedy in cable television. In the first season the gang took on some of the most controversial social issues. For example, in the first episode called "The Gang Get Racist", Charlie tries to prove he is not racist by going out on a date with a black girl. Some other issues in the first season are abortion, underage drinking, guns and sexual harassment. In all of these episodes sarcastic humor is evident like in the episode "Charlie Wants An Abortion" where Mac joins a pro life rally in order to score with one of the rally girls, while Dennis joins a pro choice rally convinced by Dee that a pro choice rally will have more women. These episodes set up the grounds on what the series is all about. A sarcastic adult dark comedy were laughs are not missed in every single episode. For the second season and to add more market value to the series, FOX added Danny Devito to the cast as Dee and Dennis father (Frank Reynolds). Also we get to meet Mrs Reynolds (Anne Archer) Dee and Dennis' mother. Both parents are probably more selfish and opportunistic than their kids. The addition of these characters give more material to the series writers. But it is not Danny Devito's performance in the show what has center stage, it is Mac, Dee, Dennis and Charlie who steal the show. Their spontaneous humor and the way to make comedy is what takes this series to the next level. For the third season Fox is giving this excellent comedy a great opportunity by releasing it in the fall, which gives the sitcom a better chance to become popular. Scenes From The Original Pilot. A couple of scenes from the pilot episodes "Charlie Has Cancer" and "Mac Meets Carmen"
Making-Of Featurette: "Sunny Side Up" A nice 17 minutes featurette were the cast talk about how the show came to live. Featurette: "Making a Scene" 9 minutes documentary about the new additions to the show for season 2, including how Danny Devito got to be part of the show. Featurette: "Kaitlin's Audition Tapes" A 5 minutes talking about Kaitlin's audition. The Gang F*#!s Up - Outtakes A 4 minutes of outtakes not as funny as the show.